Irans islamistiska ledare kallar USA idioter, men medger att sanktionerna biter | Vad händer i Mellanöstern idag? ← Hezbollah har terroriserat Europa sedan 1979 – Är det dags att vakna nu EU? Iranian Supreme Leader Ayatollah Ali Khamenei said Wednesday that American sanctions are putting pressure on Iran and its people. 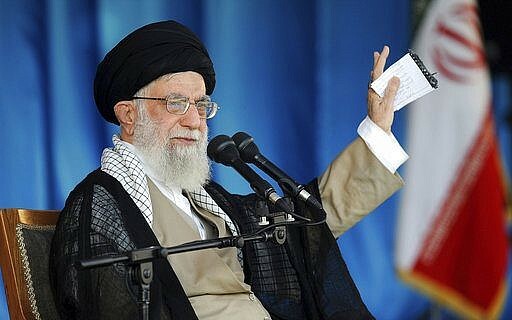 In an unusually forceful speech from the holy city of Qom, Khamenei also mocked American leaders, as top US diplomat Mike Pompeo made a tour of the region. US President Donald Trump pulled out of an international agreement on Iran’s nuclear program in May and in November reimposed sanctions on Tehran. Iran has ignored Western calls to curb its military development and has pushed ahead with repeated ballistic missile tests. The Iranian military recently announced its intention to deploy warships to the western Atlantic off the US coast as a counter to American military presence in international waters off Iran. Khamenei also cited a story about a US official once predicting he’d celebrate Christmas in Iran to lash out at Americans. The supreme leader did not name the official. However, US National Security Adviser John Bolton told a meeting of the Iranian exile group Mujahedeen-e-Khalq last March that “before 2019, we here … will celebrate in Iran.” Trump’s personal lawyer, former New York Mayor Rudy Giuliani, has made similar comments before the MEK over the years. Iran’s supreme leader, viewed by Shiite hardliners as second only to God, typically doesn’t make such forceful remarks. However, Trump’s decision last year to withdraw from the nuclear deal has seen the 79-year-old cleric grow increasingly critical. Punishing sanctions against Iran over its nuclear program had been curbed as part of a 2015 nuclear deal, but were largely re-imposed by the US last year, under Trump, who has taken a hard line toward Iran. Trump has labeled the landmark agreement forged under his predecessor Obama as “defective” and unable to rein in Iranian behavior or halt the Islamic Republic’s quest to develop nuclear weapons. Det här inlägget postades i Hot mot DEMOKRATI, Iran, Islamister / Jihadister, Islamska Staten, USA. Bokmärk permalänken.